You must be lucky to book a Yogyakarta tour package during the ceremony of Grebeg Syawal in Yogyakarta. This is because you will have more chance to learn about the local tradition. 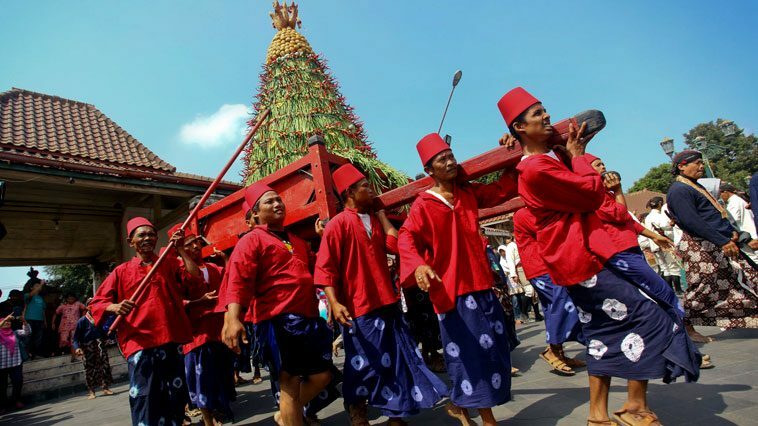 Different to any other days in Yogyakarta, the day of Grebeg Syawal will be much livelier. There are more things to experience and watch as well. Grebeg Syawal ceremony is actually a tradition to celebrate the Eid Fitri. Different to the other regions, the way people of Yogyakarta celebrate this Islamic holiday is exceptional. There will be some festivals that you won’t always see on Yogyakarta tour package. More interestingly, this ceremony always becomes a favorite cultural attraction for tourists too! Grebeg Syawal is characterized by Gunungan Hasil Bumi (a mountain of natural resource) which becomes a symbol of alms from the Sultan of Yogyakarta. This Gunungan then will be paraded by palace soldiers from Alun-alun Utara to three places including Gedhe Kauman Mosque, Pura Pakualam and Kepatihan Office. This is for sure a unique thing that is hard to find during a regular Yogyakarta tour package. Different to Grebeg Mulud which is a part of the series of Sekaten Ceremony event, Grebeg Syawal will only last for one day. As a result, you can still do many other things in Yogyakarta after witnessing the unique Grebeg Syawal. Luckily, there is some Yogyakarta tour package that will be fun to visit during the holiday. Here are some of the examples. Since you have been around Yogyakarta Palace, you shouldn’t go afar to have some fun. Just spend your night relaxing at Alun-alun Kidul which is not too far from Yogyakarta Sultan Palace. You can consider driving a unique “blink blink” car that makes a unique sight around the town square. With regular Yogyakarta tour package, you can enjoy this too! You haven’t gone to Yogyakarta if you didn’t visit Maliboro Street. The street is also located close to the Yogyakarta Sultan Palace. This street can be considered as the heart of Yogyakarta because it is always filled with a pack of visitors. You can have fun shopping or try some delicious street food. Your Yogyakarta tour package will be more exciting by coming here! If you want to do something extraordinary, consider sightseeing around the alley near Malioboro St, Prawirotaman St and other alleys around it. You can expect to find murals and graffiti in alleys as well as streets of Yogyakarta. It may not be included to your Yogyakarta tour package, but you can ask your tour guide whether it is possible for you to do so. Those are a few things that you can do after watching the unique Grebeg Syawal custom tradition. If you need a tour provider to help you arranging your tour in Yogyakarta, there is Jogjabromotour.com which is always ready to provide the best service for every one of you. So, book your Yogyakarta tour package from www.jogjabromotour.com now!